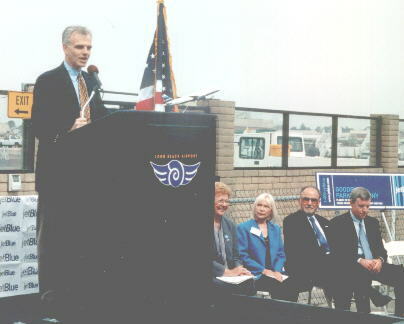 (Sept. 2, 2001) -- "We're gonna fly so many people outta here you won't be able to believe it," boasted JetBlue CEO David Neeleman, drawing applause from members of LB's political and business establishment. Below are some of the sights and sounds as JetBlue prepared to launch its inaugural commercial flight from LB Airport to NYC's JFK Airport on August 29. 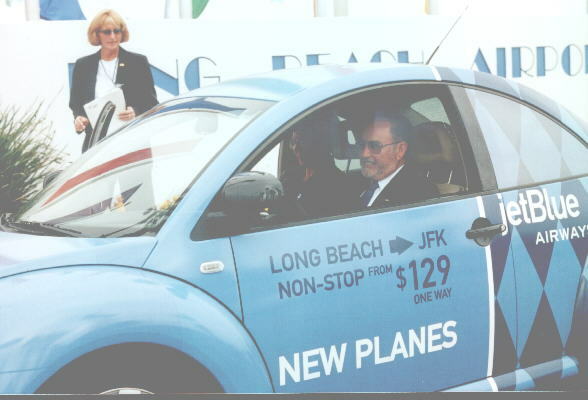 In a choreographed entrance, City Manager Henry Taboada chauffeured Mayor Beverly O'Neill (passenger seat, shadowed) onto the tarmac in a JetBlue company VW. Kristy Ardizzone, JetBlue's West Coast Opportunities Manager looks on. 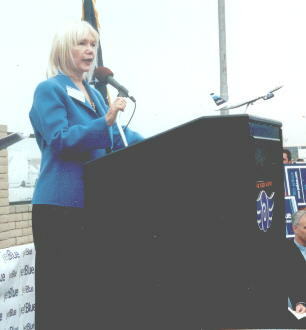 Ms. Ardizzone continues to chair City Hall's appointed Airport Advisory Commission. 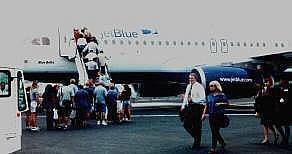 Visitors were allowed to tour one of JetBlue's Airbus A320 Aircraft (LB Airport Mgr. 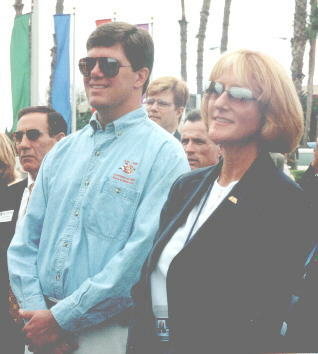 Chris Kunze walks across tarmac in foreground). JetBlue says by 2003, 27 of these planes could take off and land every day at LB Airport. City officials and business leaders applauded. Am I lucky to represent the 5th district, or what? This is a win-win situation, the most winable situation I've ever seen. JetBlue wins because they had the foresight to recognize Long Beach as the opportunity that it is. And for years, almost every group I have met with, both residents and business people, have been asking for more flights from their hometown airport to major destinations. With this start of service to New York today, JetBlue is tapping what I believe to be a gold mine. 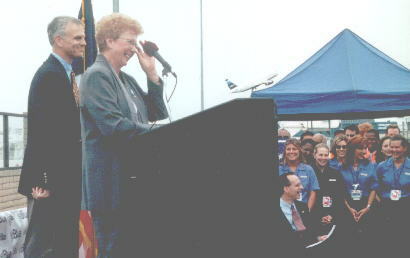 ...My task this morning is a simple one: that is, to marry the service that JetBlue provides with the facilities that the City of Long Beach will provide. Airport Advisory Commissioners Derek K. Brown and (chair) Kristy Ardizzone look on. First row guests include (at left) former Vice Mayor/3d district Councilman Doug Drummond, City Auditor Gary Burroughs and (at right) Councilmembers (and Mayoral candidates) Ray Grabinski and Vice Mayor Dan Baker. 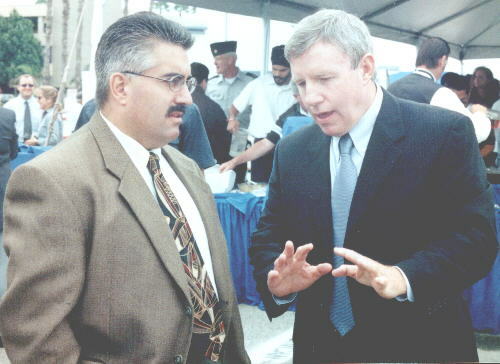 LB Airport area business leader (Aeroplex) and former Airport Advisory Commission member Curt Castagna and LB Area Chamber of Commerce Immediate Past President Mike Murray. 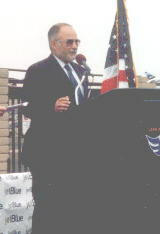 JetBlue flies two NYC flights into and out of LB Airport each day. It plans two Washington, D.C. (Dulles) flights a day into and out of LB starting in October. JetBlue holds 27 of LB's 41 large plane flight slots, reserving them in May after the City Council (without publicly mentioning JetBlue) changed a LB ordinance so carriers could hold slots for up to two years before flying.